And the winner for the most labyrinthine updo at the 2013 American Music Awards..
And the winner for the most labyrinthine updo at the 2013 American Music Awards is…drum roll, please…Kelly Osbourne! How wicked is this hairstyle?! Double cornrows are created and the ends are intertwined into a bun. As an additional pow to the style, two spike hair combs are placed on both sides. Kelly Osbourne’s blonde hair is styled in a wedge hairstyle. Her bangs are full i..
Kelly Osbourne’s blonde hair is styled in a wedge hairstyle. Her bangs are full in this girly look. Kelly Osbourne’s now infamous lavender hair was gathered into a sleek bun. The..
Kelly Osbourne’s now infamous lavender hair was gathered into a sleek bun. The fringe is swept to the side which makes a pear-shaped face, such as Kelly’s, look slimmer. 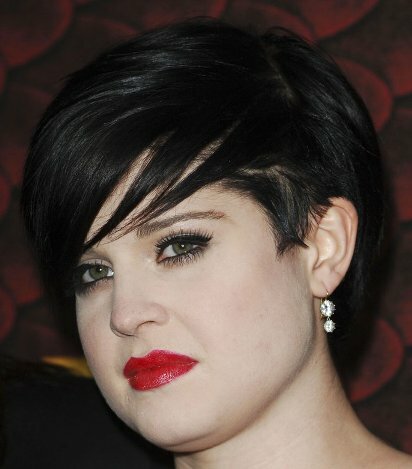 Kelly Osbourne’s black, straight hair is cut in a trendy undercut hairstyle. It is..
Kelly Osbourne’s black, straight hair is cut in a trendy undercut hairstyle. It is shaved on the sides and longer on the top. Her side bangs are the longest layer of her hair. Best makeover of the decade goes to Kelly Osbourne! Seriously, sweetie, you’re..
Best makeover of the decade goes to Kelly Osbourne! Seriously, sweetie, you’re stylist is a genius worthy of a Nobel Prize. We adore Ms. Osbourne’s high ponytail with curly bangs!